The latest pieces in GAP’s collection for this season have me coming over all festive. Think warm knits, velvet dresses and snuggly scarves. GAP asked me to style up a few pieces from the new collection and my favourite in their latest drop was of course the fairisle prints, which you can find on sweaters, gloves, hats and scarves. There are four colourways and my choice of print is the grey and pink mix that I am wearing here. 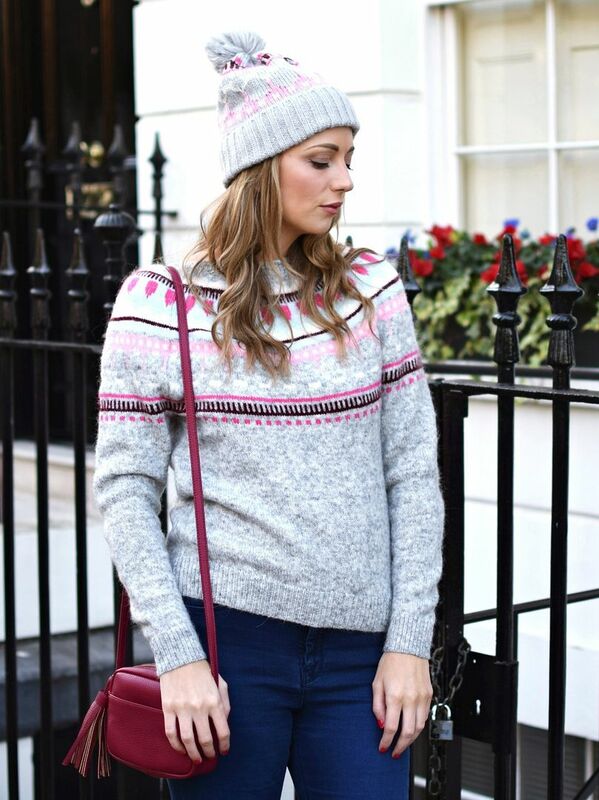 I have teamed the fairisle sweater in grey with the fairisle bobble hat to match. I think they look so cute together and definitely make a bit of a statement! The sweater is so warm and is a wool and mohair blend. I can’t stand being cold in winter and this sweater will definitely be keeping me warm in the colder weather. I love the colours of the fairisle print and it’s really easy to team with a pair of jeans and some flat boots for a casual look. The jumper is a great fit, but does come up quite big as I am actually wearing an extra small here so something to bear in mind when buying. Other colours of the jumper include a fabulous bright pink, charcoal grey and a cream-white all with their own unique colour scheme of the fairisle prints and of course have scarves and gloves to match too, perfect for Christmas gifts. 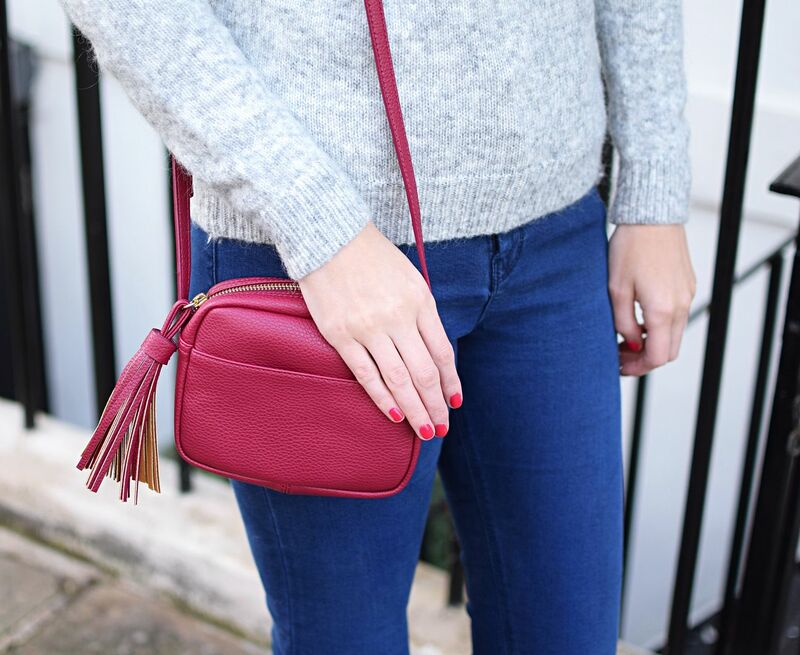 To pick up the pinks on the jumper, I have matched it with this cute berry crossover body bag. 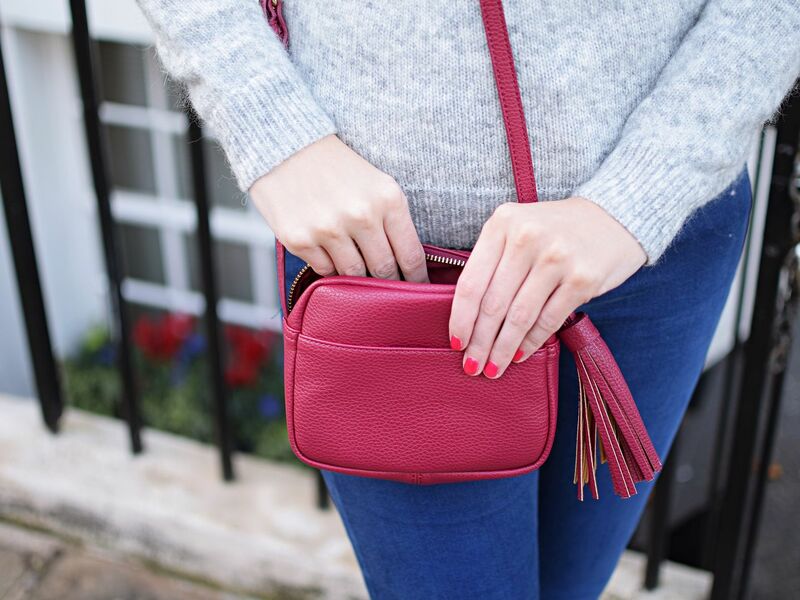 It also comes in various colourways, perfect for matching different outfits and has a tassel zip. Inside it has a small pocket and also on the front too. It’s small but the perfect size for the essentials; phone, lipstick, money and my travel card. I love your hat! The pattern is so cute! !